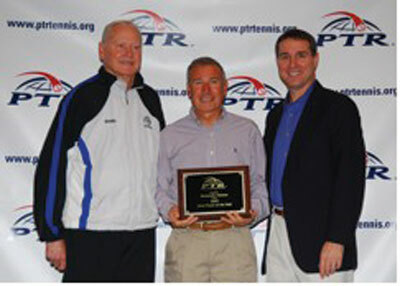 *Hilton Head Island, SC — * Professional Tennis Registry (PTR) presented its annual awards this week during the 2009 PTR International Tennis Symposium. The event, which includes 60-plus on court and classroom presentations, a tennis trade show and $25,000 Championships, was held February 14-20, 2009, at Van der Meer Shipyard Racquet Club on Hilton Head Island, South Carolina. Fernando Velasco, of Austin, Texas, was named PTR Male Player of the Year. Velasco is currently ranked #1 in Texas and #20 in the National USTA 65 and over Singles. He ended his year with a 32-10 and he was a member of the team that won both the 65 and over Division and Overall Team National Championship at the Intersectional Tournament held in Arlington, Texas. He was also named Senior Player of the Year by the Capital Area Tennis Association. Velasco, a PTR Master Professional, is the General Manager and Director of Tennis of the Circle C Tennis Club in Austin. Upon receiving the award during a reception attended by over 300 tennis professionals from all over the world, he thanked his family, coaches, and the Circle C Tennis Club that support his competing in tournaments locally, state and also nationally. He mentioned that “competing for me is not about winning. It is nice to be the winner of a match, but most important is about establishing lifetime relationships with players and people of all ages that participate”.